View of a room with a fireplace in Leicester’s Gatehouse at Kenilworth Castle in Warwickshire. Kenilworth is the largest castle ruin in England and was one of the country’s most magnificent noble residences. The Elizabethan gatehouse was built in the 16th century by Robert Dudley, the Earl of Leicester, as the new main entrance to the castle on the north side. 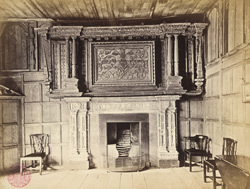 The interior shown is panelled in wood with an alabaster fireplace below an ornate oak overmantel. The fireplace is carved with the motto “Droit et Loyal”, Leicester’s initials and carvings of the badge of the order of the Garter. Leicester was a favourite of Queen Elizabeth I and she gave him the castle in 1563. It became the setting for a celebrated royal visit in 1575, when Elizabeth was entertained with spectacular pageantry for 19 days. To make it fit for such a distinguished guest, he remodelled the medieval structure of the castle into an Elizabethan palace. In addition to the gatehouse he built a formal pleasure garden and a range of lodgings in the Inner Court known as Leicester’s Building.